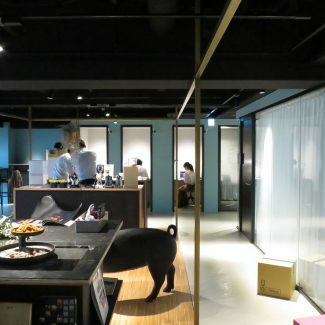 This April Mitsui Fudosan Co., Ltd. launched their new service WORKSTYLING, providing multi-site shared offices for corporate clients. The people who support the substantial activity in the front line of economy are the office workers. WORKSTYLING is a new solution providing rich alternatives that allow them to take initiative in shaping their own workplaces. Infield Design joined forces with NAD (Nikken Activity Design Lab; designing to support innovation initiatives) to design a set of “workplace behavior styles” for such workplaces. We have an expertise in focusing on the details of people’s everyday activities, and here we used it effectively to throw light on the various scenes in the reality of office working. Through this process we contributed to the discussion and planning of the experiences that should take place here, and set the premise for the actual interior design and furnishing that followed. As of November 2017 21 offices have opened, centered in the Tokyo metropolitan area and located as far north as Sendai and as far south as Hakata. New movements and businesses to mark the next generations are expected to hatch from these many incubator spaces.